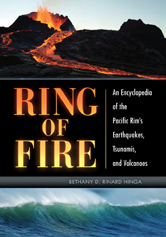 The encyclopedia offers descriptions of deadly earthquakes, volcanic eruptions, and tsunamis through time. The entries provide in-depth information that promotes an understanding of the structure of the earth and earth processes and shares the insights of scientists whose work helps clarify the causes and effects of these cataclysmic events. At the same time, the work examines how the people and cultures of the Pacific Rim view this active part of the earth, how they live with the threat of disaster, and how they have been affected by major events that have occurred.